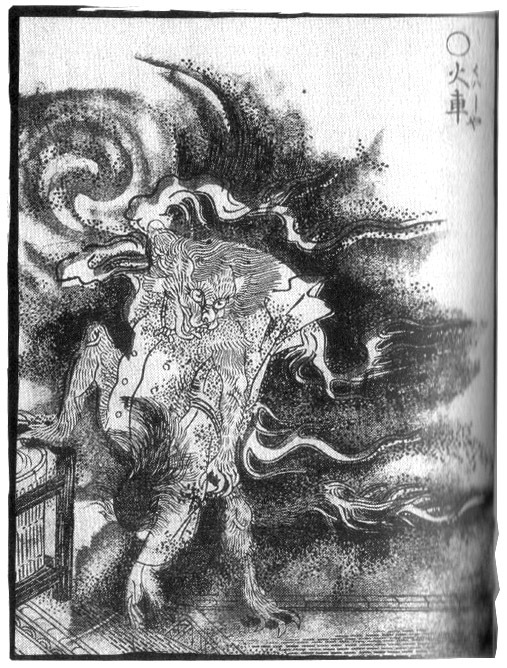 Kaibutsu Ehon (Illustrated Book of Monsters), illustrated by Nabeta Gyokuei, 1881. 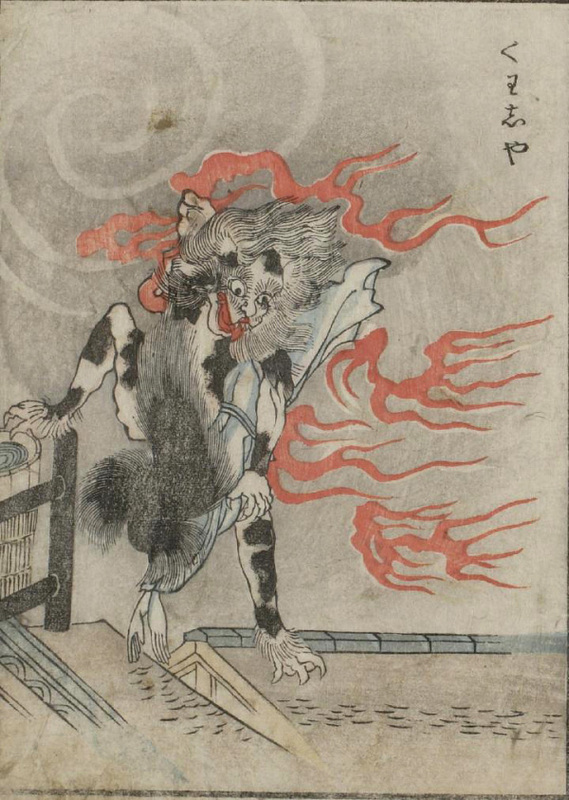 Kasha (火車) are a Japanese yōkai that bring the bodies of miscreants to hell as punishment for a life of evil deeds. Kasha are feline demons who are human-sized or larger and walk upright. When Kasha seek to make themselves known, they may be surrounded by flames and their arrival may be signified by the presence of thunder and strong winds. Thus, a Kasha’s appearance will often coincide with stormy weather. When Kasha wish to remain hidden, they can disguise themselves as ordinary cats and live among humans. Kasha prefer the night, just as their mortal feline cousins do. Kasha seek out human bodies. They are known to descend upon a funeral procession, where a crack of thunder and roaring from the sky indicates their arrival. Being messengers from hell, Kasha are charged with stealing the dead bodies of transgressors to drag them to perdition. Kasha also feed on human corpses. Ordinary cats can become Kasha when they are left in the presence of a human corpse. When cats grow aged, they can develop magical powers, transforming into a Kasha. In order to protect the dead from Kasha, rituals have been developed in various parts of Japan. Two funeral ceremonies may be performed, using the first one as a ruse to fool any lurking Kasha. During the first ceremony the casket is filled with rocks, making it too heavy for a Kasha to carry it off. The real ceremony occurs after the initial ceremony in an attempt to distract or deceive Kasha. The practice of placing a head-shaving razor on top of the coffin is believed to serve as a ward against Kasha. Prior to a funeral procession a priest twice chants, “I will not let kasha feed on this” as a form of protection. Playing the myobachi, a type of Japanese cymbal, also wards off Kasha. In some cases, bamboo cages have been built around the dead to protect them from Kasha. Kasha are well known in Japan, but their presence has also been recognized by some in Hawaii. A kasha is believed to reside in a Kaimukī house located on 8th Avenue in Honolulu, Hawai`i. Though the description of events at the house do not fit a traditional Kasha manifestation, the house’s history of violence, death, and unearthly forces, have led some to the believe a Kasha presence is at work.